Residential treatment requires a stay at a facility. The Center for Drug and Alcohol Treatment has a 16-bed residential treatment unit for men and women, ages 18 and older. Our program is highly structured and medically supervised. It is set up for those who are dealing with biomedical or mental health issues; people who are unable to abstain during outpatient treatment, or those who lack a safe living environment. The length of time people spend in residential treatment varies, with many staying for up to 30 days. For more detailed program information, please email our Program Director or call (218) 723-8444. 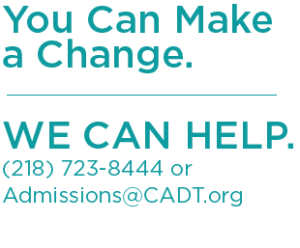 For information on how to obtain a Rule 25 Placement Assessment to enter outpatient treatment, please email Admissions@CADT.org or call (218) 723-8444.